Rows and rows of trophies sit gleaming by our East Gym. We’ve all seen them. Glittering against the cement in such a fashion you can’t help but do a double-take at the mementos of past athletic victories. But that’s just it: athletic achievements. Does our school really value brawn over brains? To combat this perception, the librarian at Penn Manor High School, Sue Hostetter, petitioned for our brain bank to have a nook of their own. Upon entering the library, but right before passing through the unchecked book alarm, immediately to the left, there is a new trophy case. Unfortunately, as soon as it went up, the case was nearly full. “It would be really nice to have the long display cases in between the library entrance and the water fountains by the gym to also be renovated to be used for academic trophies,” she noted. 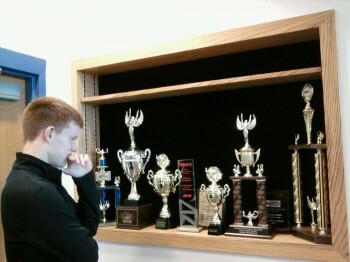 In the trophy case itself sits just under 10 trophies, each one its own symbol of brainy excellence. The trophies, range from an individual awards to national awards to quiz bowl trophies. Hostetter’s goal is to have academic awards displayed next to athletic ones, to show how our student body differs in interests, boost morale of students and Comets fans, and to have a collective area for all student achievements.